A reprint from the Taipei Times (October 13, 2014), with different illustrations. For the record, I don’t think it was betel nuts that I was chewing at Hou’s 1991 party; what I recall was a kind of barklike Taiwanese form of speed. — J.R. The year was 1991. American film critic Jonathan Rosenbaum was experiencing his first authentic night out in Taipei at a late night karaoke party hosted by renowned Taiwanese film director Hou Hsiao-Hsien (侯孝賢). Fueled by bottles of cognac and a generous supply of betel nuts, the duo belted out Beatles songs until 3am before stumbling home. Having reviewed Dust in the Wind (戀戀風塵, 1986) and A City of Sadness (悲情城市, 1989) for the Chicago Reader, long-time film critic Rosenbaum was no stranger to Hou’s work. But being in Taipei for the Asia-Pacific Film Festival gave him a better appreciation of the local culture, history and setting. 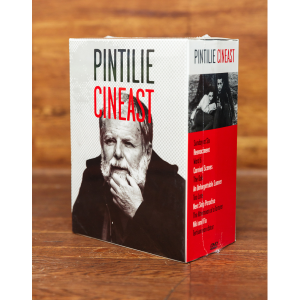 From Cinema Scope issue issue 60, Fall 2014. 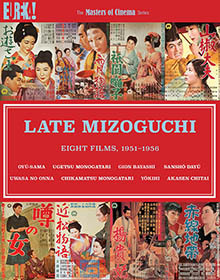 — J.R.
Late Mizoguchi – Eight Films, 1951-1956 (Eureka Entertainment). The publication of eight indisputable masterpieces in stellar transfers on Blu-ray is a cause for celebration. If Eureka is not exclusive in offering these individual titles, what makes this collection especially praiseworthy and indispensable is the scholarship, imagination and care that went into the accompanying 344-page booklet. Over 60 rare production stills are included, many featuring Mizoguchi at work. Striking essays by Keiko I. McDonald, Mark Le Fanu, and Nakagawa Masako are anthologized along with extensively annotated translations of some of the key sources of Japanese literature that inspired some of Mizoguchi’s late films. The volume closes with tributes to the great director written by Tarkovsky, Rivette, Godard, Straub, Angelopoulos, Shinoda, and others. Tony Rayns provides spoken essays and some full-length commentaries.